If you guys haven’t checked out Joe Kelly Jr.’s Playing With Cars website (the web component of The Car Room magazine) you’ve been missing out on the most informative, best-produced model car entusisast resource there is in the world. I’ve long admired Joe’s informative and entertaining video reviews of some of the coolest die-cast models and this weekend he produced a video on the Elite Batmobile! One of the best things about Joe’s videos are – him! His attitude and delivery are a breath of fresh air in this hobby. I was trying to get him a couple shots he needed of the undercarriage but I missed his deadline and he still gave us a shout-out on the video! How cool is that! One of the other great things is that Joe does his own music for his videos and produces them himself. I composed and recorded music for commercials professionally for 12 years, own a small studio and I’m still stealing Queen songs for my You Tube vids. LOL Maybe next time! Anyway – I highly recommend bookmarking his site if you’re a fan of automobilia at all, and specifically going there to watch the Batmobile video that’s up right now. 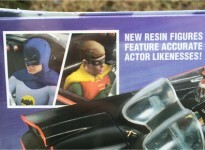 He also has great sponsors and lots of accessories that would go well with the Batmobile. Thanks for all the emails, guys – glad you liked it. Scott, great board you’ve got here. Hope to drop in from time to time! Thanks for stopping by Joe! Great site and videos you have too!